I purchased HP Racing HP5 rims with 18x8 for the front and 18x9 for the rear. 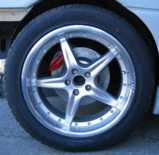 When it came to tires I went with the OEM F355 225/40/18 for the front. This tire size is perfect for the 8" rim. For the rear, I went with 255/40/18. I could not find 10" wide rims with in budget and had to settle with 9". 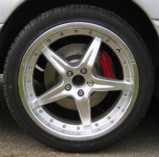 For this reason, I chose a smaller rear tire compared to a stock F355. I did not think that 10cm was going to make a big difference. Hind sight being what it is, I should have gone wider instead of narrower. Wider rear tires always look better. 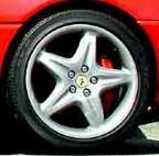 I did go with a rear tire with the closest tire height to the F355. In the tables below you will see that the front tire height is lower than the rear and I wanted to continue that look.